The War of the Worlds (also known in promotional material as H. G. Wells' The War of the Worlds) is a 1953 American Technicolor science fiction drama film from Paramount Pictures, produced by George Pal, directed by Byron Haskin, and starring Gene Barry and Ann Robinson. The film is a loose adaptation of the novel of the same name by H. G. Wells, the first of five film adaptations. It is a modern retelling of the 1897 novel, changing the setting from Victorian era-England to 1953 southern California. Earth is suddenly and unexpectedly invaded by Martians and American scientist Clayton Forrester searches for any weakness that can stop them. The War of the Worlds won an Academy Award for Best Visual Effects and went on to influence other science fiction films. In 2011, it was selected for preservation in the United States' National Film Registry in the Library of Congress, being deemed "culturally, historically, or aesthetically significant". In southern California, Dr. Clayton Forrester, a well-known atomic scientist, is fishing with colleagues when a large object crashes near the town of Linda Rosa. At the impact site, he meets Sylvia Van Buren and her uncle, Pastor Matthew Collins. Later that night, a round hatch on the object unscrews and opens; a Martian weapon disintegrates the three men standing guard at the site, simultaneously shutting down all technology in the town with an electromagnetic pulse. The United States Marine Corps surround the crash site as reports pour in of identical objects landing all over the world and destroying cities. Pastor Collins attempts to make contact with the Martians, but is also disintegrated. The Martian war machines effortlessly defeat the military with both a "Heat-Ray" and "skeleton beam". Attempting to escape in a military spotter plane, Forrester and Sylvia crash land and hide in an abandoned farm house. They begin to develop closer feelings for each other just before the house is buried by yet another crashing cylinder. They encounter and dismember an "electronic eye" on a long cable from a nearby hovering Martian machine, and collect a blood sample from a Martian wounded by Forrester with an axe while protecting Sylvia. They manage to escape unseen just before the farm house is obliterated. Forrester takes the camera housing and blood samples to his team at Pacific Tech, in the hopes of finding a way to defeat the invaders. Many of the major world capitals are destroyed by the Martians, and the United States government makes the decision to drop the atomic bomb. The Martians' force shields, however, prove impervious to the bomb's destructive power. As the Martians advance on Los Angeles unopposed, the city is evacuated, and many of the inhabitants flee to the nearby mountains. Forrester, Sylvia, and the Pacific Tech team become separated in the chaos, and their scientific equipment is stolen or destroyed. Forrester searches for Sylvia in the city. Based on a story she had told him earlier, he guesses that she would take refuge in a church. After searching through several, he finds Sylvia among many praying survivors. Just as the Martians strike the church, their machines suddenly lose power and crash, one after another. Forrester witnesses one Martian dying as it tries to leave its fighting machine, noting that they were "all praying for a miracle". In voice-over, the film's narrator observes that while the Martians were impervious to humanity's weapons, they had "...no resistance to the bacteria in our atmosphere to which we have long since become immune. ... After all that men could do had failed, the Martians were destroyed and humanity was saved by the littlest things, which God, in His wisdom, had put upon this Earth..."
The War of the Worlds opens with a black-and-white prologue featuring newsreel war footage and a voice-over describing the destructive technological advancements of Earthly warfare from World War I through World War II. The image then smash cuts to vivid Technicolor and the dramatic opening title card and credits. The story then begins with a series of color matte paintings by astronomical artist Chesley Bonestell depicting the planets of our Solar System (all except Venus). A narrator (Sir Cedric Hardwicke) offers a tour of the hostile environment of each world, eventually explaining to the audience why the Martians find our lush, green and blue Earth the only world worthy of their scrutiny and coming invasion. 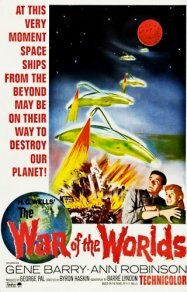 This is the first of two adaptations of Wells' classic science fiction filmed by George Pal; it is considered to be one of the great science fiction films of the 1950s. George Pal originally planned for the final third of the film to be shot in the new 3D process to visually enhance the Martians' attack on Los Angeles. The plan was dropped prior to actual production of the film, presumably being deemed too expensive. World War II stock footage was used to produce a montage of destruction to show the worldwide invasion, with armies of all nations joining together to fight the invaders. Dr. Forrester's and the other scientists' "Pacific Tech" ("Pacific Institute of Technology") has since been referenced in other films and television episodes whenever directors/writers/producers needed to depict a science-oriented California university without using a specific institution's name. The California city of Corona was used as the shooting location of the fictitious town of Linda Rosa. St. Brendan's Catholic Church, located at 310 South Van Ness Avenue in Los Angeles, was the setting used in the climactic scene where a large group of desperate people gather to pray. The rolling hills and main thoroughfares of El Sereno were also used in the film. On the commentary track of the Special Collector's DVD Edition of War of the Worlds, Robinson and Barry point out that the cartoon character Woody Woodpecker is seen in a tree top, center screen, when the first large Martian meteorite-ship crashes through the sky near the beginning of the film. Woody's creator Walter Lantz and George Pal were close friends. Pal tried to always include the Woody character out of friendship and good luck in his productions, noted Joe Adamson years later, "Walter had been close friends with Pal ever since Pal had left Europe in advance of the war and arrived in Hollywood." A 1988 network television sequel of the same name was produced. As noted by Caroline Blake, the film is very different from the original novel in its attitude toward religion, as reflected especially in the depiction of clergymen as characters. "The staunchly secularist Wells depicted a cowardly and thoroughly uninspiring Curate, whom the narrator regards with disgust, with which the reader is invited to concur. In the film there is instead the sympathetic and heroic Pastor Collins who dies a martyr's death. And then the film's final scene in the church, strongly emphasizing the Divine nature of Humanity's deliverance, has no parallel in the original book." Pal's adaptation has many other notable differences from H. G. Wells' novel. The closest resemblance is probably that of the antagonists. The film's aliens are indeed Martians, and invade Earth for the same reasons as those stated in the novel (the state of Mars suggests that it is becoming unable to support life, leading to the Martians' decision to try to make Earth their new home). They land in the same way, by crashing to the earth. However, the novel's spacecraft are large cylinder-shaped projectiles fired from the Martian surface from some kind of cannon, instead of the film's meteorite-spaceships; but the Martians emerge from their craft in the same way, by unscrewing a large, round hatch. They appear to have no use for humans in the film. In the novel, however, the invaders are observed "feeding" on humans by fatally transfusing their captives' blood supply directly into Martian bodies by using pipettes; there is also a later speculation about the Martians eventually using trained human slaves to hunt down all remaining survivors after they have conquered Earth. In the film, the Martians do not bring their fast-growing red weed with them, but they are defeated by Earth microorganisms, as in the novel. However, they die from the effects of the microorganisms within three days of the landing of the first meteorite-ship; in the novel, the Martians die within about three weeks of their invasion of England. The film's Martian war machines do actually have more of a resemblance than they may seem at first glance. The novel's machines are 10-story-tall tripods and carry the heat-ray projector on an articulated arm connected to the front of the war machine's main body. The film's machines are shaped like manta rays, with a bulbous, elongated green window at the front, through which the Martians observe their surroundings. On top of the machine is the cobra head-like heat-ray attached to a long, narrow, goose-neck extension. They can be mistaken for flying machines, but Forrester states that they are lifted by "invisible legs"; in one scene, when the first machine emerges, you can see faint traces of three energy legs beneath and three sparking traces where the three energy shafts touch the burning ground. Therefore, technically speaking, the film's war machines are indeed tripods, though they are never given that designation. Whereas the novel's war machines had no protection against British army and navy cannon fire, the film's war machines have a force field surrounding them; this invisible shield is described by Forrester as a "protective blister". The Martian weaponry is also partially unchanged. The heat-ray has the very same effect as that of the novel. However, the novel's heat-ray mechanism is briefly described as just a rounded hump when first seen in silhouette rising above the landing crater's rim; it fires an invisible energy beam in a wide arc while still in the pit made by the first Martian cylinder after it crash-lands. The film's heat-ray projector when first seen is shaped like a cobra's head and has a single, red pulsing "eye", which likely acts like a targeting telescope for the Martians inside their manta ray-like war machine. The novel describes another weapon, the "black smoke" used to kill all life; the war machines fire canisters containing a black smoke-powder through a bazooka-like tube accessory. When dispersed, this black powder is lethal to all life forms who breathe it. This weapon is replaced in the film by a Martian "skeleton beam", green pulsing bursts fired from the wingtips of the manta-ray machines; these bursts break apart the sub-atomic bonds that hold matter together on anything they touch. These skeleton beams are used off screen to obliterate several French cities. The plot of the film is very different from the novel, which tells the story of a 19th-century writer (with additional narration in later chapters by his medical student younger brother), who journeys through Victorian London and its southwestern suburbs while the Martians attack, eventually being reunited with his wife; the film's protagonist is a California scientist who falls in love with a former college student after the Martian invasion begins. However, certain points of the film's plot are similar to the novel, from the crash-landing of the Martian meteorite-ships to their eventual defeat by Earth's microorganisms. Forrester also experiences similar events like the book's narrator: an ordeal in a destroyed house, observing an actual Martian up close, and eventually reuniting with his love interest at the end of the story. The film is given more of a Cold War theme with its use of the Atomic Bomb against the enemy and the mass-destruction that such a global war would inflict on mankind. The composer of the film score, Leith Stevens, also composed two other scores for Pal productions: Destination Moon and When Worlds Collide. Each Martian machine was topped with an articulated metal neck/arm, culminating in the cobra-like head, housing a single electronic eye that operated both like a periscope and as a weapon. The electronic eye also housed the Martian heat ray, which pulsed and fired red sparking beams, all accompanied by thrumming and a high-pitched clattering shriek when the ray was used. The distinctive sound effect of the weapon was created by an orchestra performing a written score, mainly through the use of violins and cellos. For many years, it was utilized as a standard ray-gun sound on children's television shows and the science-fiction anthology series The Outer Limits, particularly in the episode "The Children of Spider County". The machines also fired a pulsing green ray (referred to as a skeleton beam) from their wingtips, generating a distinctive sound, also disintegrating their targets, notably people; this second weapon is a replacement for the chemical weapon black smoke described in Wells' novel. This weapon's sound effect (created by striking a high tension cable with a hammer) was reused in Star Trek: The Original Series, accompanying the launch of photon torpedos. The sound used when the Martian ships begin to move was also recycled by The Original Series as the sound of an overloading hand phaser. Another prominent sound effect was a chattering, synthesized echo, perhaps representing some kind of Martian sonar; it can be described as sounding like hissing electronic rattlesnakes. When the large Marine force opens fire on the Martians with everything in its heavy arsenal, each Martian machine is protected by an impenetrable force field that resembles, when briefly visible between explosions, the clear jar placed over a mantle clock, or a bell jar; cylindrical and with a hemispherical top. This effect was accomplished by the use of simple matte paintings on clear glass, which were then photographed and combined with other effects, then optically printed together during post-production. The disintegration effect took 144 separate matte paintings to create. The sound effects of the war machines' heat rays firing were created by mixing the sound of three electric guitars being recorded backwards. The Martian's scream in the farmhouse ruins was created by mixing the sound of a microphone scraping along dry ice being combined with a woman's recorded scream and then reverse-played for the sound effect mix. There were many problems trying to create the walking tripods of Wells' novel. It was eventually decided to make the Martian machines appear to float in the air on three invisible legs. To show their existence, subtle special effects downward lights were to be added directly under the moving war machines; however, in the final film, these only appear when one of the first machines can be seen rising from the Martian's landing site. It proved too difficult to mark out the invisible legs when smoke and other effects had to be seen beneath the machines, and the effect used to create them also created a major fire hazard. In all of the subsequent scenes, however, the three invisible leg beams create small, sparking fires where they touch the ground. In The New York Times, A. H. Weiler's review of The War of the Worlds noted, "[The film is] an imaginatively conceived, professionally turned adventure, which makes excellent use of Technicolor, special effects by a crew of experts, and impressively drawn backgrounds ... Director Byron Haskin, working from a tight script by Barré Lyndon, has made this excursion suspenseful, fast and, on occasion, properly chilling". "Brog" in Variety felt, "[It is] a socko science-fiction feature, as fearsome as a film as was the Orson Welles 1938 radio interpretation ... what starring honors there are go strictly to the special effects, which create an atmosphere of soul-chilling apprehension so effectively [that] audiences will actually take alarm at the danger posed in the picture. It can't be recommended for the weak-hearted, but to the many who delight in an occasional good scare, it's socko entertainment of hackle-raising quality". The Monthly Film Bulletin of the UK called it "the best of the postwar American science-fiction films; the Martian machines have a quality of real terror, their sinister apparitions, prowlings and pulverisings are spectacularly well done, and the scenes of panic and destruction are staged with real flair". Richard L. Coe of The Washington Post called it "to put it gently, terrific," and "for my money, the 'King Kong' of its day". The War of the Worlds won an Academy Award for Special Effects (it was the sole nominee that year). Everett Douglas was nominated for Film Editing, while the Paramount Studio Sound Department and Loren L. Ryder were nominated for Sound, Recording. The War of the Worlds still receives high acclaim from critics: At the review aggregator website Rotten Tomatoes, the film has an 85% rating based on 27 critics; the consensus states: "Though it's dated in spots, The War of the Worlds retains an unnerving power, updating H. G. Wells' classic sci-fi tale to the Cold War era and featuring some of the best special effects of any 1950s film". In 2018, a new 4K ultra high-resolution Dolby Vision transfer was made available on iTunes. The War of the Worlds was deemed culturally, historically, or aesthetically significant in 2011 by the United States Library of Congress and was selected for preservation in the National Film Registry. The Registry noted the film's release during the early years of the Cold War and how it used "the apocalyptic paranoia of the atomic age." The Registry also cited the film's special effects, which at its release were called "soul-chilling, hackle-raising, and not for the faint of heart". The Martians were ranked the 27th best villains in the American Film Institute's list AFI's 100 Years...100 Heroes and Villains. The 1988 War of the Worlds TV series is a sequel to the Pal film; Ann Robinson reprises her role as Sylvia Van Buren in three episodes. Robinson also reprises her role in two other films, first as Dr. Van Buren in 1988's Midnight Movie Massacre and then as Dr. Sylvia Van Buren in 2005's The Naked Monster. In Independence Day, invading aliens are defeated in part by infecting the mothership with a computer virus. There are also several other allusions to Pal's 1953 War of the Worlds: the failed attempt of a dropped atomic bomb is replaced with a nuclear armed cruise missile launched by a B-2 Spirit bomber (a direct descendant of the Northrop YB-49 bomber used in the 1953 film) and Captain Hiller being based in El Toro, California, which Dr. Forrester mentions as being the home of the Marines, which make the first assault on the invading Martians in Pal's film. The Asylum's 2005 direct-to-DVD H. G. Wells' War of the Worlds has mild references to the Pal version: Inside the Martian's mouth, they have three tongues that closely resemble the three Martian fingers seen in the Pal film. The Asylum film also includes scenes of power outages after the aliens' arrival via meteorite-ships. As in the Pal film, refugees are seen hiding in the mountains instead of hiding underground, as in the Wells novel and the protagonist actively tries to fight the aliens by biological means. Steven Spielberg's 2005 War of the Worlds, although an adaptation of the original Wells novel, does feature several references to the original film: Gene Barry and Ann Robinson have cameo appearances near the end, and the invading aliens have three-fingered hands but are depicted as reptile-like, three-legged walking tripods. There is also a long, snake-like alien camera probe deployed by the invaders in much the same manner as in the 1953 film. Mystery Science Theater 3000 named one of its lead characters, the mad scientist Dr. Clayton Forrester, as a homage to the 1953 film. In 2004, War of the Worlds was presented with a Retrospective Hugo Award for 1954 in the category of Best Dramatic Presentation — Short Form. ^ "Rentals" refers to the distributor/studio's share of the box office gross, which, according to Gebert, is roughly half of the money generated by ticket sales. ^ "The War of the Worlds - Details". AFI Catalog of Feature Films. Retrieved July 30, 2018. ^ "'The War of the Worlds'." British Board of Film Classification, March 9, 1953. Retrieved: January 11, 2015. ^ a b c d e f g h i Warren 1982, pp. 151–163. ^ a b c d e f g h i j Rubin 1977, pp. 4–16, 34–47. ^ Booker 2010, p. 126. ^ Weiler, A. H. (as A. W.), "The Screen in Review: New Martian Invasion Is Seen in War of the Worlds, Which Bows at Mayfair." The New York Times, August 14, 1953. Retrieved: January 11, 2015. ^ "Brog".Variety, April 6, 1953. ^ "The War of the Worlds". The Monthly Film Bulletin. 20 (232): 71. May 1953. ^ Coe, Richard L. (August 21, 1953). "'War of Worlds' A Real Wingding". The Washington Post: 27. ^ "The 26th Academy Awards (1954) Nominees and Winners." oscars.org. Retrieved: January 11, 2015. ^ "'The War of the Worlds'." Rotten Tomatoes (Flixster). Retrieved: January 11, 2015. ^ Jeffrey Wells (October 3, 2018). "War of the Worlds" On iTunes…For Now". hollywood-elsewhere.com. Retrieved April 16, 2019. ^ "Artsbeat:'Silence of the Lambs', 'Bambi', and 'Forrest Gump' added to National Film Registry." The New York Times, December 27, 2011.Retrieved: January 11, 2015. ^ a b "2011 National Film Registry More Than a Box of Chocolates." Library of Congress, December 28, 2011. Retrieved: January 11, 2015. ^ "Ann Robinson Biography." Film Reference. Retrieved: January 12, 2015. ^ Aberly and Engel 1996, p. 86. ^ Breihan, Tom. "=Mockbuster video." Grantland.com, October 10, 2012. Retrieved: January 12, 2015. ^ Desowitz, Bill. "War of the Worlds: A Post 9/11 Digital Attack." VFXWorld, July 7, 2005. Retrieved: January 12, 2015. ^ "Mystery Science Theater 3000." Academy of Television Arts & Sciences. Retrieved: January 12, 2015. ^ http://www.thehugoawards.org/hugo-history/1954-retro-hugo-awards/ Archived May 7, 2011, at WebCite. Retrieved February 20, 2018. Aberly, Rachel and Volker Engel. The Making of Independence Day. New York: HarperPaperbacks, 1996. ISBN 0-06-105359-7. Adamson, Joe. The Walter Lantz Story: with Woody Woodpecker and Friends. New York: G.P. Putnam's Sons, 1985. ISBN 978-0-39913-096-0. Gebert, Michael. The Encyclopedia of Movie Awards, New York: St. Martin's Press, 1996. ISBN 0-668-05308-9. Hickman, Gail Morgan. The Films of George Pal. New York: A. S. Barnes and Company, 1977. ISBN 0-498-01960-8. Miller, Thomas Kent. Mars in the Movies: A History. Jefferson, North Carolina: McFarland & Company, 2016. ISBN 978-0-7864-9914-4. Parish, James Robert and Michael R. Pitts. The Great Science Fiction Pictures. Jefferson, North Carolina: McFarland & Company, 1977. ISBN 0-8108-1029-8. Rubin, Steve. "The War of the Worlds". Cinefantastique magazine, Volume 5, No. 4, 1977. Strick, Philip. Science Fiction Movies. London: Octopus Books Limited, 1976. ISBN 0-7064-0470-X. Warren, Bill. Keep Watching The Skies Vol I: 1950–1957. Jefferson, North Carolina: McFarland & Company, 1982. ISBN 0-89950-032-3. Willis, Don, ed. Variety's Complete Science Fiction Reviews. New York: Garland Publishing, Inc., 1985. ISBN 0-8240-6263-9. Wikimedia Commons has media related to The War of the Worlds (1953 film). The War of the Worlds on Lux Radio Theater: February 8, 1955. Adaptation of 1953 film. Related texts: "The Crystal Egg"
This page was last edited on 17 April 2019, at 17:09 (UTC).